Galway Metals Consolidates the Estrades Mining District, Provides an Updated NI 43-101 Estrades Resource Estimate and Consolidates 31 Km of Strike Along the Adjacent Casa Berardi Break - Galway Metals Inc.
(Toronto, Ontario, August 18, 2016) – Galway Metals Inc. (TSX-V: GWM) (the “Company” or “Galway”) is pleased to announce that it has acquired an undivided 100% ownership interest in the former producing, high grade Estrades mine, related Newiska concessions, and adjacent Casa Berardi claims in western Quebec, Canada, located approximately 95 km north of the town of La Sarre. The claims are largely contiguous and comprise 14,854 hectares, or 36,689 acres. Galway recently commissioned Roscoe Postle Associates (RPA) to provide an updated NI 43-101 compliant Estrades resource estimate, which included Indicated Resources of 1,300,000 tonnes grading 8.0% Zn, 3.9 g/t Au, 1.1% Cu, 137.9 g/t Ag, and 0.65% Pb, plus Inferred Resources of 1,219,000 tonnes grading 4.3% Zn, 1.5 g/t Au, 1.5% Cu, 68.6 g/t Ag, and 0.26% Pb. Please see Figure 1and Galway’s Estrades presentation for more details. 1) CIM definitions were followed for Mineral Resources. 2) No Mineral Reserves are present. 3) All metal prices, the US$/CDN$ exchange rate and cut-off grade were provided by RPA. 4) Mineral Resources are estimated at long-term metal prices (USD) as follows: Zn $1.15/lb, Cu $3.50/lb, Pb $1.00/lb, Au $1,450/oz, and Ag $21.00/oz. 5) Mineral Resources are estimated using an average long-term foreign exchange rate of US$0.80 per CDN$1.00. 6) Mineral Resources are estimated at a cut-off grade of CDN$140/tonne NSR, which included provisions for metallurgical recoveries, freight, mining, milling, refining and G&A costs, smelter payables for each metal and applicable royalty payments. 7) A minimum mining width of approximately 1.5 m was used. 8) Mineral Resources that are not Mineral Reserves do not have demonstrated economic viability. 9) Numbers may not add due to rounding. Galway contracted RPA to complete a CIM resource estimate as required by National Instrument 43-101 and dated August 12, 2016 on the Estrades property, where approximately 94,000 metres of historic drilling occurred. A full report will be posted on Galway’s website and on Galway Metals’ issuer profile at www.sedar.com within 45 days. As seen in Table 1 above, tonnages are approximately evenly divided between the Indicated and Inferred Resource categories. Indicated Resources total 1,300,000 tonnes grading 8.0% Zn, 3.9 g/t Au, 1.1% Cu, 137.9 g/t Ag and 0.65% Pb, while Inferred Resources amount to 1,219,000 tonnes grading 4.3% Zn, 1.5 g/t Au, 1.5% Cu, 68.6 g/t Ag and 0.26% Pb. As seen in Table 2 below, at the higher NSR cut-off of CDN$180/tonne, grades increase by an average of 15%, which should provide excellent flexibility in weaker metal price environments. Preliminary analysis indicates that no metal is dominant; however, gold and zinc are the main contributors. Table 3 below provides Galway Metals’ Resource Statement, which includes both Estrades and the recently acquired Clarence Stream deposits. It shows that Galway has Indicated Resources of approximately 345,000 oz of gold at 5.0 g/t and 228 mm lb of zinc at 8.0%, plus Inferred Resources of approximately 310,000 oz at 4.0 g/t Au and 115 mm lb at 4.3% Zn, plus additional Ag, Cu and Pb resources in both categories from Estrades. 2) Mineral Resources were estimated using an average gold price of US$1,000 per ounce (oz) and assumed operating costs. 3) Mineral Resources are based on a cutoff grade of 3.0 grams per tonne (g/t) gold (Au). 4) Wireframes at 3.0 g/t Au and a minimum thickness of two metres were used to constrain the grade interpolation. 5) High gold grades were cut to 30 g/t Au prior to compositing. Uncut grades are listed for comparative purposes. 6) Several blocks less than 3.0 g/t Au were included to expand the lenses to the two metre minimum thickness. 7) Clarence Stream Mineral Resource estimate is current as of September 7, 2012. 8) Estrades Mineral Resource estimate is current as of August 12, 2016. Infill drill Estrades to increase the resource where gaps exist along the 1.6 km strike length of mineralization; drilling is planned to start in January upon sufficient freeze-up. Drill mineralized structures to depth below the Estrades resource where they remain open. Much of the 1.6 km of strike remains open to depth. This is highly prospective ground in which the Main, Central and East Zones are hosted in essentially one long sheet of mineralization with small breaks between the zones. A post mineralized cross fault moved the Central and Eastern Zones approximately 225 m south, but the location of all three zones are traceable along the full length of the favourable horizon. This represents very good continuity of mineralization. Conduct a gravity geophysical survey along the current Estrades resource, along extensions east and west of the resource, and along the Newiska horizon to find VMS vent areas. Drill previously delineated but never followed up downhole geophysical anomalies, and undertake hole-to-hole geophysics (induced polarization) on key deeper holes to locate potentially thick source-vents of copper-rich mineralization. Evidence of these copper-rich vents exist at both Estrades and Newiska. At Estrades, several historic drill results near the bottom of the Main and Central Zones intersected thick chloritized felsic volcanics that are normally found proximal to massive sulphide vents systems. Encouraging is that subsequent downhole electromagnetic surveys indicate conductor anomalies. A similar feature was also identified at Newiska to the south. Note: TW for Newiska are unknown. Estrades was an operating mine with concentrates produced via toll milling at Matagami, located 128 km to the east. Recovery rates using conventional methods of crushing, grinding, gravity, flotation and cyanidization were 93% Zn, 90% Cu, 86% Pb, 78% Au and 63% Ag. After milling was completed, Breakwater transported the concentrates 290 km south to Rouyn-Noranda for smelting. Using its cost estimates for mining, transportation, milling, refining and G&A, and estimates for metallurgical recoveries, smelter payables for each metal and applicable royalty payments, RPA arrived at a net smelter return (NSR) cut-off grade of CDN$140/tonne. Breakwater closed the mine amid falling metal prices, with zinc, copper, lead, gold and silver dipping below (USD) $0.45/lb, $1.00/lb, $0.25/lb, $350/oz and $4.00/oz, respectively. Galway intends to initially focus on creating shareholder value by expanding the Estrades resource through exploration. Estrades has good continuity vertically and horizontally (sheet of mineralization). It is vertical, and at near 90 degrees dip is ideal for long-hole mining methods. The 200-metre deep by 150-metre along strike decline that was driven in the Main Zone is available to be extended to the east to access extensive mineralization in the Central and East Zones. When mining ended, mineralization was developed but not mined. Cash payment for all the properties Galway acquired, including the Estrades, Newiska and Casa Berardi claims, was CDN$1.35 million. In addition, Galway will issue 800,000 units, subject to regulatory approval, with each unit comprised of a share valued at CDN$0.25 and a three-year warrant exercisable at CDN$0.52 (deal terms were established when Galway’s shares were at CDN$0.14). The Company has also agreed to issue three royalties on portions of the properties (see below). Excluding any value for the royalties and warrants, the price that Galway paid was US$5.57/oz, giving zero credit for all the other metals; on an in-situ gold equivalent basis the purchase price was US$1.47/oz. Now that both the Clarence Stream (August 3, 2016 press release) and Estrades acquisitions have been completed, Galway has a cash balance of approximately CDN$9.4 million and no long-term debt. Mistango River Resources (CSE: MIS): Cash payment of CDN$700,000, plus a 1% NSR royalty on portions of three claims that comprised part of the old mining lease, which hosts the Main Zone and part of the Central Zone. This royalty has a buyout option at any time for CDN$1.0 mm. Mistango also contributed seven km of strike length along the Casa Berardi Break. CR Capital (TSXV: CIT-H): Cash payment of CDN$150,000 on CR Capital’s property in which it held an approximate 64.6% interest. CR Capital’s property hosts a portion of the Central Zone, the East Zone and the Newiska Block. First Quantum Minerals (TSX: FM): No cash or share payment. First Quantum exchanged its approximate 35.4% minority interest in CR Capital’s property for a 2% NSR royalty. There is no buyout option on this royalty. First Quantum’s share of the CR Capital property hosts a portion of the East Zone and the Newiska Block. Private Company: CDN$300,000 cash and 800,000 units as described above, subject to regulatory approval. The private company held rights to all historic data on the Estrades property. Globex Mining Enterprises (TSX: GMX, G1M — Frankfurt, Stuttgard, Berlin, Munich, Tradegate, Lang & Schwartz Stock Exchanges and GLBXF — OTCQX International): CDN$200,000 cash and a 1% Gross Metal Royalty (similar to an NSR royalty). There is no buyout option on this royalty. Globex held approximately 24 km of strike length along the Casa Berardi Break. Claim Staking: Galway staked 1,396 hectares for CDN$1,500 along the favourable Estrades and Newiska felsic rhyolite horizons. There are pre-existing NSR royalties of 2.0% on Mistango’s and Globex’s Casa Berardi claims. On Globex’s claims, 1.5% of the 2.0% royalty can be purchased at any time for CDN$1.5 mm. Note: There were no finders fees associated with the agreements, all transactions occurred on arms-length bases and the date of the agreements was August 17, 2016. 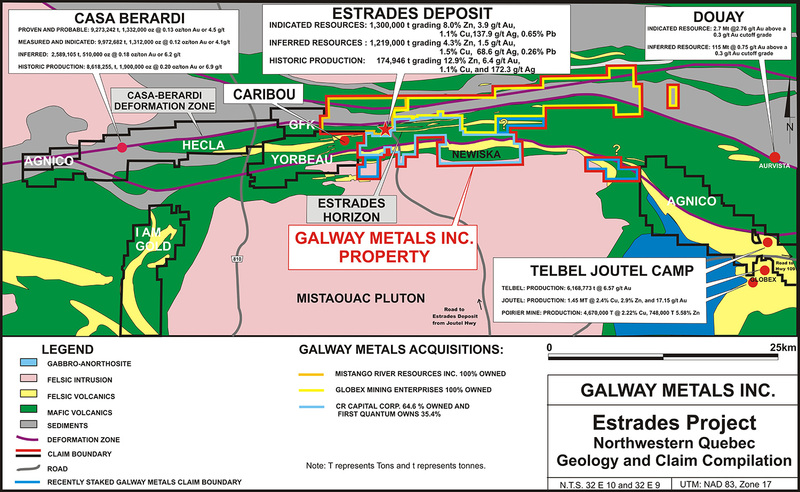 Concurrent with the Estrades and Newiska consolidations, Galway has acquired an undivided 100% ownership interest in approximately 31 km of strike length along the Casa Berardi Break, a major but underexplored gold-bearing fault system immediately adjacent to the north of Estrades. In total at Estrades, Newiska and Casa Berardi, Galway has acquired a large 14,854 hectare, or 36,689 acre, highly prospective land position along two important current and historically producing horizons. The Estrades and Casa Berardi structures are different, with Estrades (and Newiska) mineralization hosted in Archean volcanogenic massive sulphides (VMS) containing gold, silver, zinc, copper and lead, while Casa Berardi is classified as an Archean sediment-hosted lode gold system. Galway’s Casa Berardi property is located 24 km along strike from the Casa Berardi mine (owned by Hecla Mining), which has produced approximately 1.9 million ounces (mm oz) of gold grading 6.9 grams per tonne (g/t), and has Proven and Probable Reserves of 1.3 mm oz grading 4.5 g/t Au, Indicated Resources of another 1.3 mm oz grading 4.1 g/t Au, and Inferred Resources adding a further 0.5 mm oz grading 6.2 g/t Au. Given the significant production history and future of the mine, Galway considers the major and underexplored Casa Berardi Fault System to be a high-priority target for new discoveries. As noted above, in order to acquire its Casa Berardi property, Galway completed agreements with Mistango River Resources and Globex Mining Enterprises Inc. Note: TW are unknown for Globex and Mistango River properties.